Featured Video Resource: Paul Carden, The Challenge of the Cults on World Mission Fields. Need practical, biblical tools on the cults and occult? Equip yourself — and support CFAR. Description: Buddhism is on the rise, especially among young people. The kind face of the Dalai Lama appears to promise peace and reconciliation without "religion." That’s the problem—some people are now starting to call themselves "Buddhist Christians" and claim to "belong" to both. 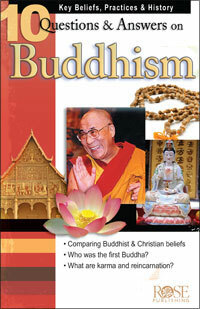 This new pamphlet will help you to both understand and answer the claims of Buddhism. Notes: Questions answered include: Who was the Buddha? What did the Buddha teach? What are the major branches of Buddhism? What is the Buddhist view of God…or gods? What’s the Buddhist view of reincarnation? What’s the Buddhist view of salvation? With tips for reaching out to Buddhists, definitions of helpful terms, and resources for further study.